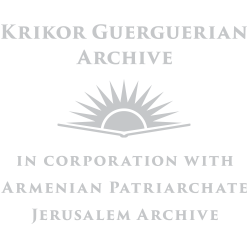 The Krikor Guerguerian Archive consists of documents collected by Guerguerian throughout his life, starting from the 1930s until his death in 1988. Despite scholars’ prior awareness of the Archive’s existence, almost nobody had ever utilized it. The primary reason for this is that the Archive had never been sorted, catalogued and classified. The materials within the Archive were in a state of utter disarray were lacking in a systematized structure. While transferring all of the Archive’s materials online, we conducted a limited classification and divided the documents into three primary categories. We named these categories the First, Second and Third Archives and uploaded them into separate sections. Detailed information about each of these separate archives and the documents that they contain can be found in these respective sections. The First Archive consists solely of Ottoman materials. The majority of the documents pertain to the trials, from 1919-1921, against the Committee of Union and Progress members and perpetrators of genocide. The original documents of these materials are either lost or being held in secret by the Turkish government. The materials available here are comprised of films taken by Guerguerian in the mid-1960s of documents whose hard copies are being held at the Armenian Patriarchate in Jerusalem. We had the opportunity of comparing the documents that Guerguerian filmed with the documents at the Armenian Patriarchate in Jerusalem. This comparison revealed that Guerguerian had filmed nearly all of the existing materials on the tribunals. We thank the Armenian Patriarch of Jerusalem Archbishop Nourhan Manougian for providing us with the opportunity to conduct this comparison. For the story on how the documents regarding the Istanbul Tribunals reached the Jerusalem Archive, please look at the section outlining Guerguerian’s life story. A second portion of these Ottoman documents was taken from the Boghos Nubar Pasha Library in Paris, including the documents containing the Memoirs of the Ottoman bureaucrat named Naim Efendi and the Talat Pasha telegraphs. The entirety of the Ottoman materials have been sorted, classified and transcribed. Their translation into the English language is ongoing. The Turkish transliterations and the English translations will be uploaded as they are completed. Furthermore, a detailed index explaining the content of each document has been created, facilitating the researcher’s access to documents of interest. The Second Archive is comprised of Guerguerian’s personal works. Until his death in 1988, Guerguerian worked on the materials he collected by taking various notes and translating them into several languages, including Armenian, French and English. He also wrote books on various topics, such as the Yozgat and Kayseri trials of 1919-1920. Out of respect to Guerguerian’s work as well as the difficult nature of sorting and classifying these materials, we left these extremely disorganized and unsystematized documents as they are. However, we decided to provide special commentary containing some general information on these Armenian, French, English and Turkish materials, as well as a highly detailed index that we prepared. Utilizing these two tools, the reader will be able to navigate the documents of Guerguerian’s Private Archive with ease. The Third Archive contains original materials collected by Guerguerian from the national archives of other countries. The French and Armenian documents belonging to the Istanbul Patriarchate comprise an important section of the documents in this section. Furthermore, documents from the Austrian, German, British and American national archives can also be found here. A commentary containing additional information on this archive as well as a special index were created for this section. The Guerguerian archive is a set of scans in PDF format that reside in Clark University’s Digital Commons. Important note: The original materials comprising the Guerguerian Archive have been donated to the National Association for Armenian Studies and Research (NAASR) in Belmont, MA, where they will become part of NAASR’s Mardigian Library. Following the opening of NAASR’s new headquarters building in fall 2019 these materials will become available to researchers.